Here at the Oregon Soap Shoppe the CHOCOLATE GOODIES we have to offer have some very important features... they are 100% guilt free, 100% calorie free, OH so very good for you and only mildly "habit forming"! 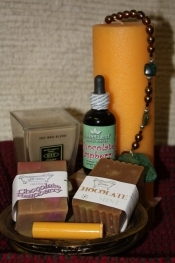 Our delicious chocolate varieties of soaps or any of the other 150 plus blends really nurture the skin you are in! Besides the Chocolate Mint, Chocolate Amber & Milk Chocolate Almond soaps for your bathing adventures, we can help keep your lips kissable with Chocolate Covered Cherry and Chocolate Mint lip balms. Relax and luxuriate with Chocolate Bath Salts or exfoliate with Chocolate Mint Sugar Scrubs. All of our skin care products are handmade onsite with the highest attention to detail with original formulas and natural ingredients. We can only accommodate groups of 10 or more at one time. This place is a little hidden gem. Stop in and check out their local and Illinois made gifts, foods, and specialties. Enjoy a relaxed and casual river town vibe and gourmet coffees, mocha lattes, muffins, desserts and other goodies new treats weekly. Located in a historic brick building built in 1906 brought back to life which boasts the original art deco soda fountain from the 30's. Bring a book and get cozy in the relaxing lounge area. Bike rentals are available from April - October. Join them on Facebook for hours events and promotions! At Steam Anchor you can enjoy the best of fresh goodies, baked daily! They offer pastries, cookies, muffins and a large variety of items of sweets & treats. Coffees and lattes are a great complimentary items as well! Like & follow on Facebook for hours events and promotions! Scroll to bottom of page to visit their Facebook page and website. Sunshine Bakery & Café is located inside Central Bank on May Mart Drive in Rochelle. 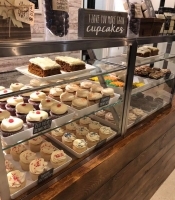 The newly-remodeled space features a café menu of cookies, cupcakes, artisan bread, custom-designed cakes and desserts, fresh salads, soups, and a host of handcrafted candles and wooden gifts. An offering of locally-blended JavaMania Coffees and beverages will be featured daily. Like & follow us on Facebook for hours events & promotions! We carry a variety of pastry items, specializing in homemade old-fashioned cinnamon rolls, quick breads/bars, and muffins as well as homemade cakes, pies and cookies! 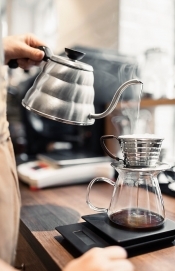 Our locally roasted coffee is the finest around and is freshly ground and served just as you like it. For lunch enjoy one of our homemade soups, a fresh salad or one of our signature sandwiches. To like & follow Sweet Bean on Facebook or visit website scroll to the bottom of this page. The Crystal Cork Wine Shoppe and Wine Bar offers wonderful Chocolate Ports, Chocolate Martinis and hand made Belgian Chocolates from their own handcrafted recipe. Hand dipped chocolates are available to enjoy paired with your favorite wine or take them to go, they make great gifts. If you aren't sure which wine goes with which chocolate? Allow our knowledgeable staff to assist you. We offer intimate seating for gatherings and special events for up to 52. Scroll to end to visit our website, Facebook Page & Instagram. Dennis Little and his staff have been making delicious homemade chocolates, popcorns, and much more for over 30 years. Stop in today and try one of their homemade goodies! 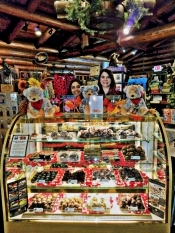 Hand-dipped chocolates, gourmet coffees, caramel and cheese popcorn, novelty and holiday candies and gift items. The Village Bakery is located in downtown Oregon and is a great place for breakfast & lunch, baked goods, desserts, coffee and ice cream. Hours are Mon-Fri 6am-9pm and Sat-Sun:7am-9pm. This unique bakery offers a wide selection of fresh baked goods, desserts, coffee, frozen drinks and ice cream. At the Village Bakery adults with disabilities work shoulder to shoulder with a professional staff, learning skills needed for employment. The goal is to gain a resume and a reference; giving potential future employers the assurance they need to hire with confidence. People with disabilities can have an active and meaningful role in today’s world of work – they just need a better way. Located in the beautiful White Pines Forest State Park, discover the historic lodge restaurant, pioneer guest cabins, delightful country gift shop and entertaining dinner theater that make up the Whit Pines Inn. Chocolate lovers will delight in the gift shop’s assorted chocolate, truffles & myrtles and the restaurant’s chocolate cobbler & ice cream desserts. Motor coach groups easily accommodated. The Windmill Cultural Center Gift Shop offers a variety of European chocolates specifically from the Netherlands. Chocolates from this part of the world are second to none. Chocolate bars, cookies, thins, mints, and candy can be purchased to widen your chocolate tastes to a global level. Proceeds from the purchases go to Friends of the Windmill who help continue Dutch traditions and culture in Fulton, IL.